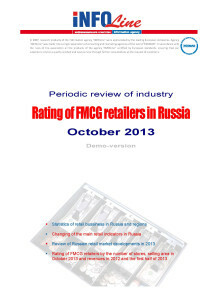 Rating of FMCG retailers in Russia: June 2014. 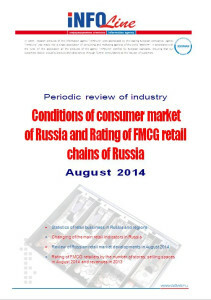 Industry review "Rating of FMCG retailers in Russia: June 2014" contains structured information about development of retail chains, comissioning of new stores, new formats, mergers and acquisitions, corporate events, logistics, results of operations and forecasts, investment plans and cooperation with leading suppliers of retail chaines in FMCG format. This review also includes: macroeconomic indicators, statistics and analytical information about development of retail and commercial chains inRussiain the reporting month, results of 2013, information update on June 2014. Structure of the review "Rating of FMCG retailers inRussia: June 2014"
Section includes a description of the operating results of TOP-130 chains, FMCG, dynamics of the number of stores changes, retail, sales, and FMCG major chains of theRussian Federation. 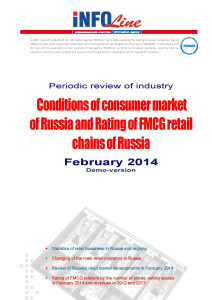 Section II. 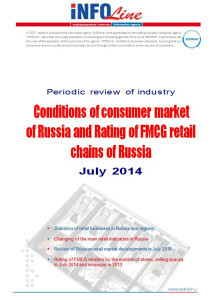 This section provides information on activities ofINFOLineIA specialists and primary events capable to influence FMCG retail ofRussia, case about Consumer Behaviour in 2014.